OK so yes, it’s not even Halloween yet and I’m about to talk about Thanksgiving. But if you’re one of those way-way-ahead Thanksgiving planners, you’ve probably already got most of the menu hashed out for the big day. Me? Well, I’ve got the rolls covered! Thanksgiving for us has varied greatly for the past few years. The first year we were hitched, we had Thanksgiving at my parents’ house, so my mom and dad were in charge of the food (and I was in charge of the eating, natch). The following year, we decided to host Thanksgiving, for both families, in our 700-square-foot apartment. It was chaotic and merry all at the same time, and hot. So hot. Twelve people and a not well-ventilated kitchen with the stove and oven going all day in a small space makes for an Amazon-like atmosphere, just FYI. The next year, we hosted Thanksgiving at our place again but for half the people, which was still merry but less chaotic and Amazon-like. And the year after that, we spent Thanksgiving with Elliott’s fam at their place. For a few of those years we’ve been in charge of the turkey and some sides and/or desserts. But as much as I love ALL OF THE THANKSGIVING FOOD (seriously, last meal? Thanksgiving dinner), my favorite thing to make for the holiday is rolls. Because carbs. 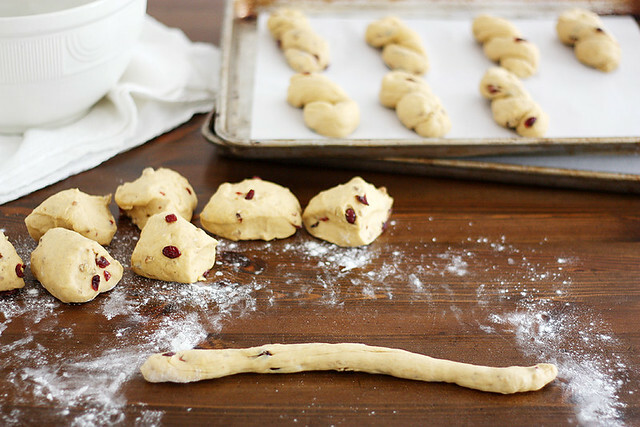 This year, we’ll be making the trek down to my parents’ house for Thanksgiving, and these pumpkin cranberry twists are coming along for the ride. That is, if they stick around for that long. We’re already down two (for recipe testing purposes!…), and I’m not sure I can hold out another month before I sneak another roll or five. There are a few reasons why I love these rolls. 1) They have pumpkin and autumn spices and dried cranberries and pecan bits in them, so they taste like a fall flavor explosion in your mouth (and they make your kitchen smell that way, too), 2) They’re super-soft on the inside with an ever-so-slight chew on the outside, which in my opinion is the primo, grade-A, top-choice consistency for rolls, and 3) They’re going to look pretty on the Thanksgiving table. And I’m such a sucker for good food presentation. Whether you’re a mega-Thanksgiving planner and you’ve already got the grocery list put together for the big day, or you’re waiting until a few weeks before to hash out the menu, or if you’re one of those people who waits until the morning of Thanksgiving to think about the food and you end up buying cold cuts and cranberry sauce in the shape of a can (which I kind of love to eat, actually), I implore you to think about adding these twists to your Thanksgiving table. Your tummy will be so thankful. P.S. Check out Red Star Yeast on Facebook, Twitter, Pinterest and Google Plus. Using a wooden spoon or dough hook attachment, stir in remaining flour 1 cup at a time until a dough forms. Knead by hand on a lightly floured surface 7-10 minutes until smooth and elastic, adding more flour as needed OR knead on medium speed with dough hook attachment 5-6 minutes until smooth and elastic, adding more flour as needed. Shape dough into a ball and place in a lightly greased bowl; turn to coat. Cover with plastic wrap and let rise 1 hour in a warm place until doubled. 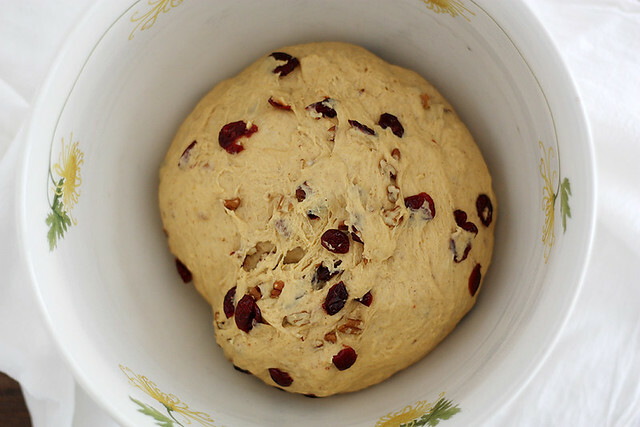 When dough is doubled, punch down and knead in cranberries and pecans. Divide dough into 16 equal pieces. On a lightly floured surface, roll out each piece of dough into a 12-inch log. Fold each log in half, then twist both ends once, pinching seams to seal. Place twists on 2 parchment paper-lined baking sheets. Cover baking sheets with tea towels or lightly greased plastic wrap. 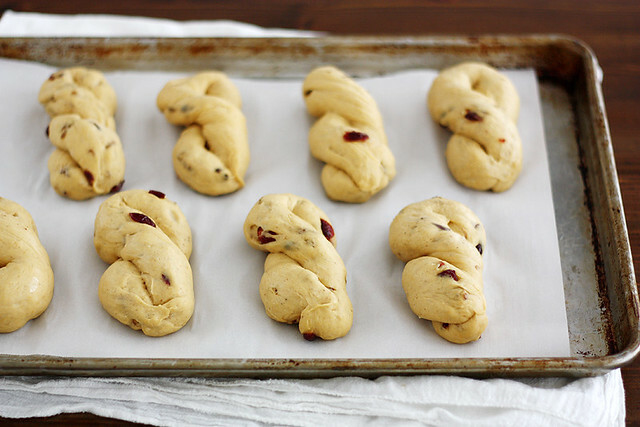 Let twists rise until puffy, about 45 minutes. Heat oven to 425 degrees F. Uncover twists; brush with beaten egg. Bake 15 minutes until golden brown and baked through. Cool slightly before serving. They are so gorgeous! 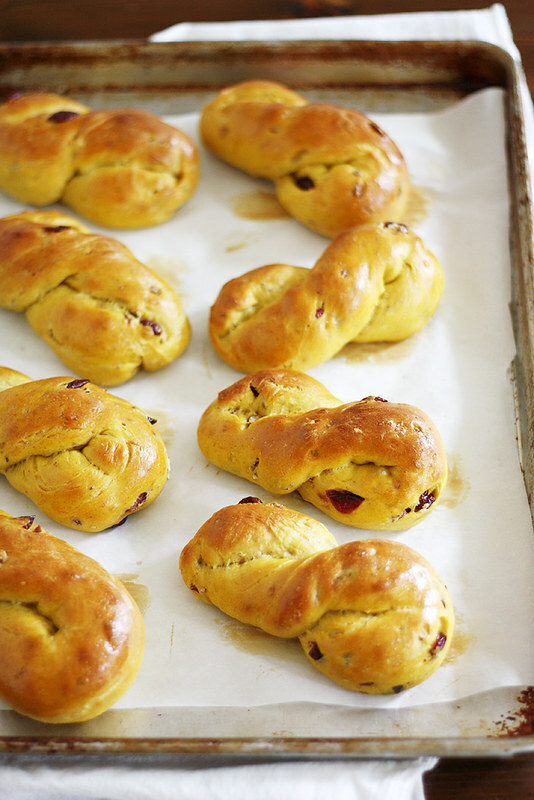 Pumpkin cranberry twists are definitely acceptable for skipping over Halloween and going straight to Thanksgiving. These things are so fun and festive and I bet a blast to bake! Nothing beats a good roll at Thanksgiving. You just have to have them! These look awesome and are so festive too! Pinned for later! Girl, I’ve had Thanksgiving on my brain for a couple weeks now! Is it weird that I’ve already planned my entire Thanksgiving menu?! I was planning on parker house rolls, but I’m going to have to switch it up in favor of these beauties!! Definitely saving this recipe for the big day! Awesome Steph! Genius!! Forgetvthe turkey and just gimme these! Perfect. Perfect. Perfect! These twists are to die for Steph! You forgot to mention that you had to work that crowded Thanksgiving so the sauna-like atmosphere was temporary for you! BUT, bringing this rolls will make up for any memory lapse you may have had! I wish I could reach through the screen and eat one of these RIGHT NOW! Ugh. They look so good. They definitely would not make it in the car with me. I’d have to make double the amount. We are away from family for Thanksgiving but we’re having a get together with friends and I have pretty much have to make these now. I’m sure they will be a hit! Please pass the pan because I need these twists in my life! There is no way these would last until Thanksgiving in my house! I am thinking about making them just because. What a great sounding combination and the twists look so darn pretty too! Love these! The bread at Thanksgiving always seems to be something I don’t plan ahead for, then end up buying store-bought rolls at the last minute. Definitely will have to try these this year! I already know that I am making and bringing these to my inlaws for Thanksgiving. I totally want to host a holiday. I know that my small kitchen could fit everybody but it would be, like you said, soooo hot. Aw Stephanie, you’re so talented! Your breads always come out super beautiful and fluffy, I’m so jealous 😉 I need to make these as soon as possible, I’m so looking forward to having some spare time so I can make homemade bread!! Get out of town, these are SO gorgeous, Steph! I’d happily slip these beside my Thanksgiving turkey. Love the flavor. Very creative and I bet so delicious! Julia — Right? I mean, I love Halloween but we need to talk about these rolls. 🙂 Thanks, dear! Tieghan — Thanksgiving just isn’t the same without rolls! 🙂 Thanks for pinning, dear! Ali — Thank you! They’re totally easy to make! Kelli — Oh I’ve been dreaming of Thanksgiving ever since fall began — I love it so much. And you should definitely make room for these AND the Parker House rolls on your table; they’re both delicious! Laura — Yeahhhhhh, it’s definitely not happening again, I’ll just say that. 😉 Thanks, friend! Erin — Haha, it’s what the cool kids bring 😉 I think I’m going to have to make another batch of these because the ones that are stored in my freezer right now are TAUNTING me! Belinda — I agree! They’re just too good to leave to a couple months 🙂 Thanks! Sarah — Oh yes, I’m already thinking a double batch is necessary so that even a few of these make it home 🙂 I hope you make them for you and your friends this year; you’ll love them! Laura — This is when those 3-D screens would come in handy, right? 🙂 Thanks, love! Kathryn — Thank you, friend! Nicole — That always happens to us with the cranberry sauce, and then we end up getting the canned stuff (which I love anyway because I’m weird, but still :)). You should definitely give these a go this year! Stefanie — Oh man, hosting a bunch of people with a tiny kitchen is crazy, but fun! Buuuuut crazy. 🙂 I hope you and your fam love the rolls! Georgia — Thank you so much, friend! These are super fun and look totally delicious!! LOVE! They look awesome! Do you freeze them? I am still deciding which breads to make. We’re hosting a second Thanksgiving dinner on Saturday but going to my husband’s parents’ house on Thursday, so I’ll get to make some of everything this year. You have utterly nailed the thanksgiving roll. You have crammed so much thanksgiving into these, I can’t even deal. I would eat 50 because carbs! My mom always made us pumpkin twisty rolls (what I called them) when I was little. I love the cranberries you added! These look so incredibly soft and chewy – I want one for breakfast with my pumpkin coffee. Katrina — Thanks so much! Megan — Yep! They’re in my freezer right now. It’s why I love making rolls for the holidays, because you can make them way ahead of time! Carbs for dayz!!!! Love these.. These look and sound incredible! I may have to switch the rolls I was going to make for Thanksgiving with these! 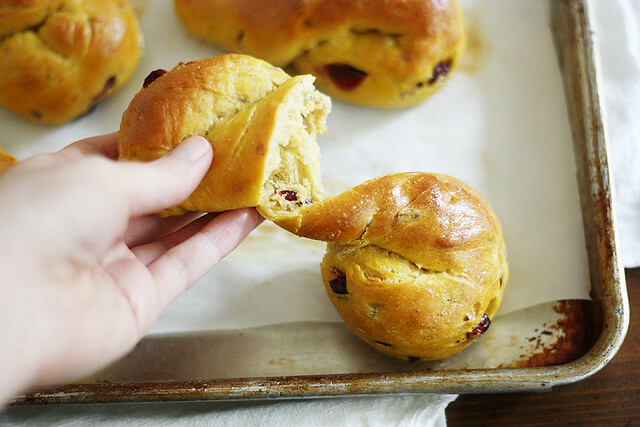 These braided rolls are so beautiful, especially with the glossy crust and the cranberries peeking out from the dough. So pretty (and delicious, I’m sure!). I don’t think I’ll be able to wait for Thanksgiving to try these! Love it!! Perfect for Thanksgiving! Pinning! Erika — ALL THE CARBS 4EVA. Anna — Thanks so much! My favorite thing about Thanksgiving is the bread too! It’s not everyday when you can have a buttery, yeasty, warm piece of carb! 😉 These look fantastic and perfect for the holidays! SO perfect for Thanksgiving! Pinning right now!! These twists are stunning, Steph! And you know I can’t wait to make this until Thanksgiving – I need it now! Can these simply be made into boules (rolls) instead of twists? Would it throw off the baking time? Grace — Piece of carb <-- love it! 🙂 Thanks, dear! Jenni — Of course! I don’t think it would throw off the baking time, but you should just keep an eye on them to make sure they’re golden brown on top and sound hollow when tapped on the bottom. I love the addition of cranberry! Such great flavor and pretty to boot! Yum! 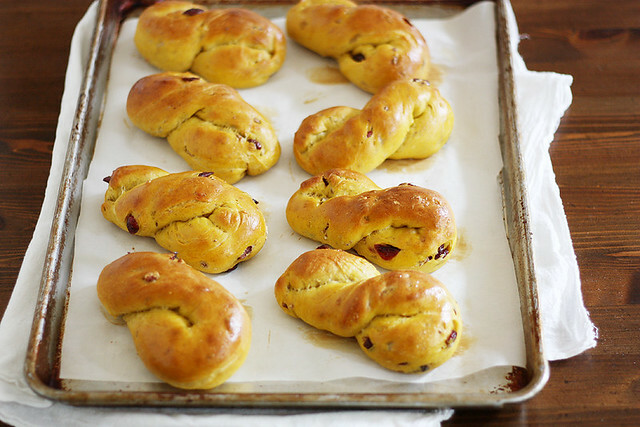 This recipe looks similar to something we make in Sweden in December: Lussekatter (Or Saffron Buns). You think you’re only going to eat one, then oops! Half a dozen are gone! these are a great idea. I love it! Even though I end up making most of Thanksgiving dinner, I usually go to my mom’s because my apartment is too tiny to hold more than five people in it lol. These twists are almost certainly going to make an appearance this year! Though I can’t promise they’ll make it past the appetizers. We are big on carbloading for the BIG meal. These are a serious upgrade from traditional Thanksgiving rolls. In fact I’ll skip dinner if I can just have these. I’m a crazy mega Thanksgiving planner, and these will be happening for sure this year! I just spent a very fun evening making these to see if they were Thanksgiving worthy. I had a little trouble with the twist. Only two turned out as pretty as yours, but my oh my did they ever taste yummy! The maple syrup gives it just enough, but not too much, sweetness. The cranberries give it a tanginess, and the pecans give it some texture. The pumpkin and spices just bring it all together. I totally skipped dinner and ate 3 twists instead. There is no telling how many I’m going to eat tomorrow. Luckily, I can take some to work. I can’t wait to make them again at Thanksgiving. You created a masterpiece. And now my family will think I have, too! Thanks. Yes hooray for carbs! No better way to celebrate occasions like Thanksgiving than with all kinds of carbs. And these rolls look so soft and inviting. If only I can get over my fear of yeast, I would make these. I want to come bake with you. Amazin. I’m also Team Thanksgiving Dinner Rolls. I could probably do without the turkey and just have rolls and sides. I can’t wait to give these a try! Do you have any advice for making these in advance? 3-4 days in advance? Great recipe! Jen — I would bake them completely, then place them in plastic bags and put them in the freezer. A few hours before you plan to serve them, I’d take them out of the bags and let them come to room temperature, uncovered, on the countertop. If you want them warm, you can also put them in a 250 degree oven for a few minutes once they’ve returned to room temp. Hope that helps! Can you sprinkle sugar on the tops of these? Did anyone who commented actually make these. What were the results?